According to recent industry reports Honda Cars India Limited, the Indian alliance of Japanese car maker Honda Motors is all set of hike the price of its entire portfolio from April 1, 2017. The price hike will be up-to Rs. 10,000 on all the cars, except the recently launched cross-over WR-V. The line-up of Honda Cars in India includes Honda Mobilio, Honda Jazz, Honda Amaze, Honda Brio, Honda CR-V, Honda WR-V, Honda BR-V and Honda Accord Hybrid. 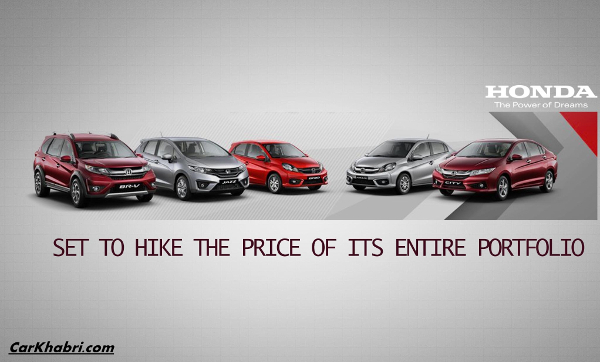 This price hike will be second hike made by the car maker during this year, after the first hike introduced earlier this year. Commenting on the reason behind increasing the prices of their cars, Mr. Jnaneswar Sen, Senior Vice-President, Sales, HCIL said, due to increasing cost of inputs and freight charges it has become imperative for them price their products in compliance to the cost of production. The price of Honda cars varies from Rs. 4.69 lakh to Rs. 37 lakh (ex-showroom prices, New Delhi). It would be interested to know that along with Honda Cars, domestic car maker Tata Motors has also hiked the prices of its entire portfolio in the range of Rs. 5,000 to Rs. 25,000. Similarly, country’s leading car maker Maruti Suzuki India Limited has also hiked the prices of its fleet up-to Rs. 8,000 to compete with the impact of increasing cost of production.